Hoover Dam also is known as the Boulder Dam, was constructed between 1930 and 1936 by the U.S. in the Black Canyon in the Lower Colorado Region, located at the Arizona- Nevada border. It is the highest dam in the U.S and 726 feet (221 meters) high and 1,244 feet (379 meters) long at the top. 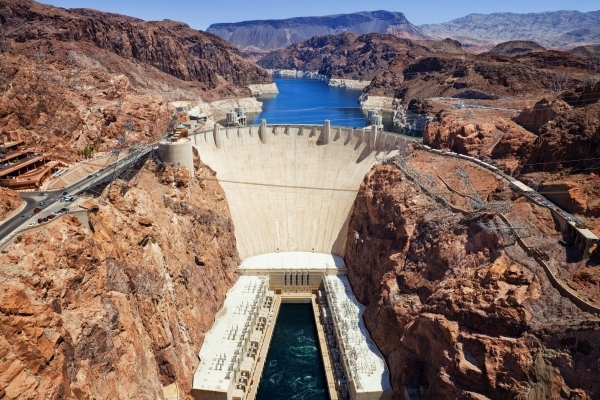 Another amazing fact is that it blocks away from the Lake Mead which is one of the largest artificial lakes in the world and stretches up to 115 miles (185 km) upstream. The dam is constructed to hold water powerfully for agricultural irrigation, hydroelectricity generation, and flood control and for domestic water supply. It is also one of the most famous tourist destinations and attracts millions of visitors every year. Almost one million tourists every year go on tour through the dam. The dam was named in the honor of the former U.S president Herbert Hoover under whose supervision the construction of the dam began. The dam contains so much concrete that it is enough to stretch across the country- The Bureau of Reclamation, Department of the Interior supplied a massive 3.25 million cubic yards of concrete for the construction of the dam itself and further gave 1.11 million cubic yards for the power plant. This amount of concrete can build almost 3000 miles of road. The concrete was cooled by the world’s largest refrigerator- Such high amounts of concrete were impossible to be cooled by small machinery and hence the engineers built the world’s largest refrigerator that made it possible to cool down this concrete in a faster time period. The massive fridge dispensed a thousand tons of ice each day, for this speedy process. During the first summer of construction, the workers had to endure high summer temperatures- The work on the Hoover Dam started in April 1931, the time when Nevada’s Clark County faced its hottest temperatures on record. It recorded a temperature of 119 degrees Fahrenheit, which made it highly difficult for the workers. In other words it was just a mere publicity verdict by one without the consent of the others. The Dam helps the Power Three States- The energy produced by the dam provides light to California, Arizona and Nevada, generating power for around 1.3 million people.